Jonathan Malm: Find him on Twitter, his personal site, SundayMag.tv or ChurchStageIdeas.com. Dave Shrein: Find him on Twitter, his personal site or listen in on the Church Marketing Podcast. Grab a Copy of Unwelcome: Digital $7.49 (reg $9.99) or Print $9.89 (reg $12.99). That sale lasts this week only, so get it now. 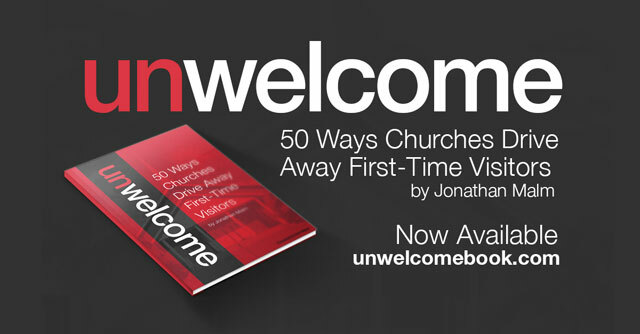 More on Unwelcome: Learn more about the book and grab a free sample. Horror Stories: We asked for your Church Visitor Horror Stories and—yikes!—did we get them. Firing the pastor, saving seats or stalking visitors are good ways to creep out visitors. Sunday Sneeze: Get Jonathan’s take on making a good first impression. Asking What If: Jonathan’s thoughts on church innovation. More Books by Jonathan: Created for More and Developing a Series. Visitor Overload: Plenty of further resources on making visitors feel welcome.